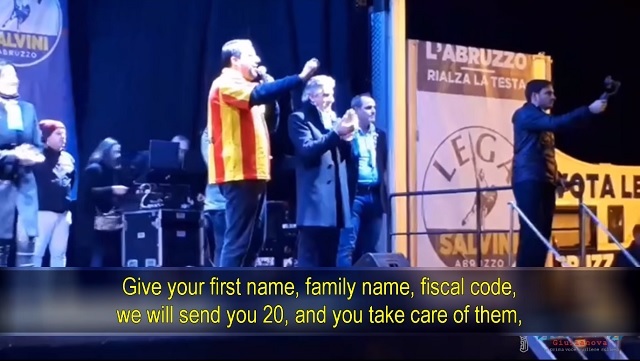 Populist Italian Interior Minister Matteo Salvini schooled a leftist protester pushing open borders over the the weekend by telling him he'll have the state send him 10 to 20 migrants to his house to personally take care of. Note, at the 34 second mark the correct translation is: "The more money communists make the more they preach morality to others." 00:03 then come the people in the rest of the world. 00:06 Here you have had� S***ty murderer! 00:10 There is a precious contribution from a gentleman who says that I am a s***ty murderer. 00:18 who has won ten immigrants for his home. 00:26 lunch, supper, dinner, my friend. 00:30 The (leftist) communists are fantastic because the more money communists make, the more they preach morality to others. 00:35 The Fazios, the Savianos, the Gad Lerners. 01:00 which are then perhaps sold in Giulianova. 01:08 and I will send those people back home, from the first to the last, from the first to the last.